I have finally made some long overdue additions, corrections, and overall housekeeping to The Conlanger’s Library. You can see the primary ones on the “Most Recent Updates” block on the homepage. I have a number of other things I’d like to do to the Library’s overall look, etc., but we gotta start somewhere. You’ll also notice that the countdown to St. Hildegard’s Day is at 70 days. I had made a St. Hildegard’s resolution last year, so we’ll see if I can fulfill that. I do have a new Kryslan blog that I can use for information on Dritok. We’ll see if the Fates are kind. Catford’s Phonetics: An Essential Resource! 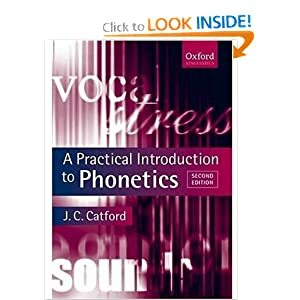 Although J.C. Catford’s A Practical Introduction to Phonetics has been part of The Conlanger’s Library for some time, it was only recently that I sought it out in the library to take a look. I have a recent (Nov. 4, 2010) posting of a glowing recommendation of the book on the CONLANG listserv for bringing it back to my attention. Luckily, my day job is at a large public library, and it was on the shelf just waiting for me to pick up. The brief biography on the cover of the book states simply that J.C. Catford is “widely regarded as the leading practical phonetician of our time.” According to his obituary posted online, he was also “famous for his amazing ability to repeat speech backwards” and recorded Jabberwocky in this way (backwards and forwards) for the BBC. In his retirement, Prof. Catford worked on Ubykh, “a language of 80 consonants and just two vowels!” So, maybe it’s no wonder that Amazon.com lists as one of the “Customers Who Bought This Item [i.e., A Practical Introduction to Phonetics] Also Bought” Mark Rosenfelder’s Language Construction Kit. Say a velaric suction [|\ [in X-SAMPA, a dental click]]. Now immediately after the sucking movement of the tongue and the release of the tongue-tip contact, remake the contact and reverse the tongue-movement — that is, press instead of sucking — then release the tongue-tip contact again. The result should be a velaric pressure sound, for which there is no special symbol, so we shall represent it by [|\^ [again, in X-SAMPA]]. Continue to alternate velaric suction [|\] and velaric [|\^]: [|\], [|\^], [|\], [|\^] . . .
All this must be done without ever releasing the essential velaric (k-type) initiatory closure. We will now demonstrate that velaric initiation, whether of suction or pressure type, utilizes only the small amount of air trapped between the tongue-centre and an articulatory closure further forward in the mouth. To carry out this demonstration make a prolonged series of velaric sounds, for example [|\], [|\], [|\], and while continuing to do this, breathe in and out rather noisily through your nose. The experiment should be repeated with hum substituted for breath. Make a series of [|\] sounds while uninterruptedly humming through the nose. This proves that the velaric initiatory mechanism is completely independent of the pulmonic air-stream — it uses only the air trapped in the mouth in front of the velaric closure. And this is just one of the exercises. I’m considering a voiced bilabial trill for one of my other languages and had never even considered a bidental fricative before now. Granted, one has to be careful to not make a kitchen-sink phonology, but a careful choice among the myriad sounds offered by Catford’s book can go a long way to giving one’s conlang any Sprachgefühl one wishes. I finally got around to posting the three (fairly) recent articles that were tweeted (@FiatLingua) in the Magazine section of the Library. Namely, the one on ROILA (the spoken robot language), the one on “how to write the next great alien language” from io9, and one from Crossed Genres. Á harya alassë! A new email address has finally been implemented for The Conlanger’s Library: library – at – conlang – dot – org. Readers can use this email address to contact the Conlanging Librarian to suggest new materials for inclusion in the library or to ask questions about existing materials. …plus, we’re coming up on the one year anniversary of this blog. Hmmm…we’ll have to think of some way to celebrate. Limits of Language by Mikael Parkvall of Stockholm University. The book is an entertaining collection of trivia, facts, and information on language, linguistics, and languages. The calendar is also an interesting collection of important dates for the field. Enjoy! Have you ever wanted to share your love of conlanging with a group in a more-or-less formal classroom setting? Have you ever wanted to give a presentation on the art and science of conlanging? The Conlanger’s Library can now help! The Education page at the Library contains materials you can use to create a PowerPoint presentation, handouts, and also includes inspirational videos. Materials there have been created by Nathan Richardson, Sai Emrys, Sheri Beth Wells-Jensen, and yours truly. If you have any items from formal classes which you have taught or presentations which you have given and you’d like to share them with the community, email lcs (at) conlang (dot) org. A new book has been added to Books (Science Fiction): Years in the Making: The Time-Travel Stories of L. Sprague de Camp. Several new articles and a video (from Arika’s appearance at Geeking Out) have been added to the Press Coverage of Arika Okrent and her popular book. And, finally, a new article by Arika Okrent herself that appeared at Slate.com about Paul Frommer’s Na’vi. Find this one in the Press Coverage of Dr. Frommer and his language of Pandora.